Not too many days ago, someone said to me after a holiday party in which we all shared some music and treats, "we must create more times like this - these warm and welcoming times. These loving times. These times that feed the soul" And that sounds so fetching and wishful. And truly, I suppose we might create those moments any time of the year. But that comment made me ponder and reflect on the magical and spiritual qualities of this time of the year - this Solstice, this Christmas, this Yule, this Festival of Lights. I have felt something so deep in preceding years as I gaze out across snow covered fields with gaunt and skeletal trees, as I long for the mountains in their capped silence and sentinel strength. There always seems to be a misty quality, a haze that stretches its fingers around and thru and penetrates even my heart now. I am so aware of something so much more real than this reality itself. Those spirits past and present. Those spirits future and beyond. Those who have preceded us into the West and those yet to come. But more than anything those that have gone on before seem so vibrant and whispering in these still and wintry moments. I feel the cold physically but the warmth of these feelings overcomes that and I am so touched by these spirits and these hauntings and these images that feed my soul. There is a different narrative this time of year. There is a resonance and an echoing that I can't deny as I hear each person speak and as I see each object before my eyes. It's as though everything projects more dimensions than usual. It's as though everything has been drawn and then painted with foam paint to create a raised relief that strikes me in unusual ways. I feel as if there is all wisdom hidden in these shorter days and long nights. There is much that is aged and ancient in these wizened traditions. I feel as if I watch, I will notice something I never have before. And this brings me back to what my friend said and my feeling that these times can't be so easily created at other times in the year. At this time of year, we all huddle around a small fire and don't mind the closeness of another in this search for warmth. At this time of year, we sip warm drinks and feel the fluid running and trickling thru our beings and spreading this comfort with it. At this time of year we wear more clothing and cuddle under more blankets and feel this need for companionship. We don't mind so much the crowding and the family and all the trappings of the holidays. And so we need each other more and we need the blazing fire and the reminders that spring isn't quite so far away. We move more slowly and maybe eat a bit more. There isn't this need to strive or accomplish in the same way that spring and the new year drive us to. There's a slowness and a nostalgia and a reflection that I find unique. So I believe these times are the magical ones. The things we do are often infused with a love that reaches far back, perhaps before the beginning of time. The ministrations we give ourselves over to connect us to this past and this present and those that are so far away and perhaps even to those that are gone on from our realm. We serve and eat this warmth and this comfort. We send cards to those we haven't communicated with for possibly a year or more. We reach out in ways we don't as often in the rest of year. We are more charitable, more hospitable, more aware of those in need. And these things contribute something. And these things place us differently. These tiny actions create auras that that are infrequent at other times. And I wonder if these auras of ours, begin to blend and grow as light meets light and love meets love until they burgeon into something bigger and more tangible and there is like so many rocks thrown in a lake and the ripples growing and growing until they meet in choppy undeniable waves. I see tiny lights twinkling and making less the darkness. I feel shadows made less with familiar carols and phrases I have heard since before I was born. And I see these pictures of traditions and harmony as if I was looking into illuminated snow globes with tiny figures posed in love and giving. Colored lights, warm cookies, cards with glitter, green trees and the smell of cinnamon and pine. But still more..these snow crusted fields, these broken wooden fences, these purple shadows that reach their arms to a twilight sky - this time between the times alight with magic. And these places rising higher and higher and breaking into snow capped peaks and tall indigo mountains. And I feel this rising and this chorus. There are so many here and they are not all human. But they are strong with us and they are there for us. And I wonder at their being and there lack of place at other times when I am so sure of their presence now. This melody or this hymn sung with more voices than mine fills the cold and humid air, freezing in little crystals of light and shimmer. I wonder if what I feel will be more clear in time. Or perhaps the mystery is what adds so much to this season for me - layers of snow upon layers, blanketing and obscuring. And so I continue on, making cookies, having friends over, serving hot cocoa and playing the old familiar carols. I serve this dinner or that. I give hugs and receive the love there is. Family...Friends... Even strangers. I feel so much in the eyes of those I care about and even in the eyes of those I barely know. Those eyes. So many lovely eyes - darker and deeper in these dim lights. I see their sparkle and their love. I see their tears and the crinkle that comes in laughter. This yearning or this wonder. I hear and I absorb and I wonder. This wonder. O beautiful wonder that makes me keep reaching for more of this journey and this time. And the greatest thing - the greatest of all these, love and heart. And these are synonymous with warmth for me. And that I will reach to give in any way I can. I bend down, my knees touching the frozen snow. 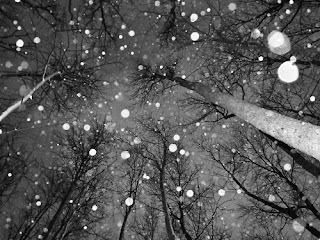 I reach out and touch falling snow with my bare fingers. Cold stings and freezes and so I let the snow slip thru my hand and cram my fingertips back into that too-small coat pocket. Icy crystals reflect twinkling lights and shimmer. I can't shake these things and I don't fully understand them. But memories that I have never had, and songs that I haven't yet heard press at me and call to me. 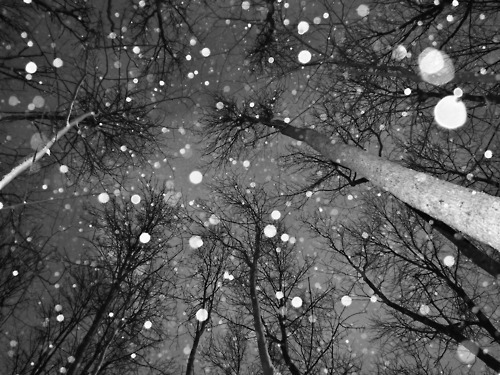 And I wish I could follow them into the mystical night, the glitter of stars, and the glow of smooth snow that blunts anything harsh but the cold itself.